Dill is a versatile herb. You can snip its ferny leaves to use as a garnish or let it flower and set seed heads to pick for flavoring. It doesn’t even need to be in a vegetable or herb garden. In this photo taken at Brookgreen Gardens (South Carolina) it was used in a border with ornamental grasses. The blue-green stems and leaves of the dill, with its yellow flowers hovering overhead, looks great intermingled with the grass. Dried dill weed and dill seed are staples in my kitchen. They suffice when there isn’t any growing in the garden or preserved in the freezer. The fresh from the garden dill is so much more aromatic. Dill is easy to grow. It is best planted where it can stay. It has a taproot, which makes it a bit more difficult to transplant successfully. If you are purchasing plants or growing them indoors from seed, be sure to move them to the garden when they are quite small and disturb the roots as little as possible. You can sow dill outdoors quite early. It prefers soil that is cool, 50-60 degrees, for germination. Dill will withstand a late frost but you should get the seeds in the ground after the heavy freezes have passed in your area. Sow the seeds in a sunny well-drained spot. Barely cover them with soil. Since the seeds are large, they are easy to space 3-4 inches apart. The little seedlings should appear in about 3 weeks. Once they are up and growing, thin them out, ending with plants about 8 inches apart. Use the thinnings as garnish. Don’t let their initial small size fool you. They can grow to be about 3 feet tall and about as wide. Care is easy, too. Keep the soil moist until the seedlings emerge and are well established. Then water the dill plants when they look droopy. Be sure to harvest and preserve some of the ferny leaves for use later on. Kitchen shears make this chore easy. Take the longest side branches and leave the top to continue growing. The plants will bloom and go to seed as the days lengthen and heat up. When summer has turned on the heat, the plants will die. If you leave your soil undisturbed and you let some of the seed heads ripen in place, the reward come fall can be new little dill plants that seeded all on their own. Cooks and gardeners with very little room can still grow dwarf dill in a pot or in a corner of the garden. Its bluish green wispy foliage even looks at home nestled in amongst the flowers. 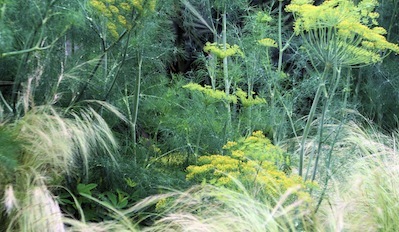 Dill, like parsley, should be a staple in a butterfly garden. Black swallowtail butterflies lay eggs on the foliage. Be sure to plant plenty to share with the resulting caterpillars. They will munch some of your leaves before turning into those beautiful creatures you see floating overhead.